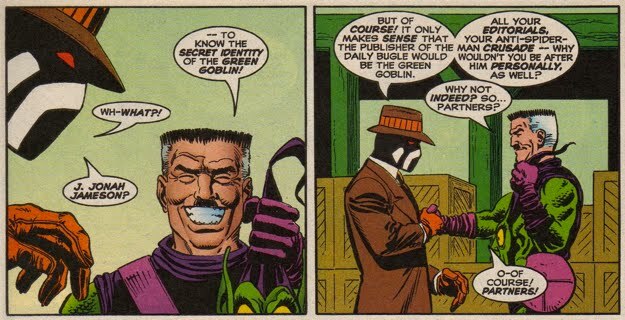 This section of the Goblin's Hideout is dedicated to documenting the history between the surly J. Jonah Jameson and the maniacal Norman Osborn. Their relationship has been nothing short of dysfunctional and their inevitable confrontations have always been traumatic. So, gentlemen...any words before we begin? The exact circumstances behind the initial meeting between these two Spiderverse heavy-weights, to date, is unknown. Their mutual well-to-do status ultimately landed them in a similar social environment, as they brushed shoulders with same crowd of corporate magnates that populated the upper class society. Norman was depicted as being a close confidante for Jonah in the early years, despite Norman's duplicitous lifestyle and treatment of Jameson. It is also unclear as to what drew Jameson close to Norman as opposed to any other member of their executives club. 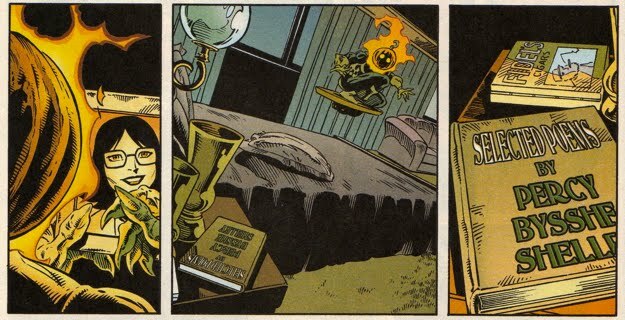 To get an idea of Jonah's feelings in regards to his friendship with Norman (whilst under the impression that Norman was dead) we can take a look at this panel from Spectacular Spider-Man #200. 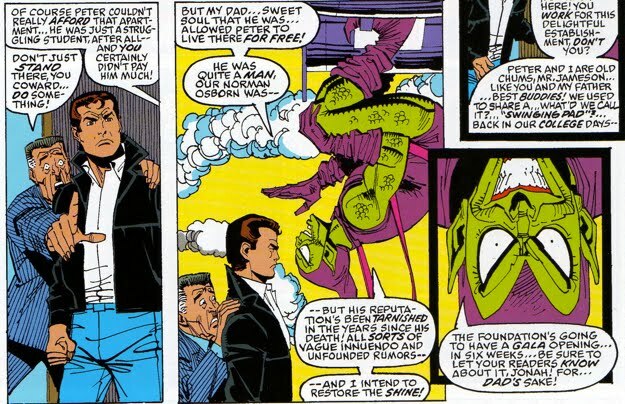 As Jonah realizes that Norman's son Harry has taken up the mantle of the Green Goblin, he explains to Harry that he and Norman 'were best of friends'. So its a fairly safe assumption that Norman and Jonah were pretty close during the years prior to Norman's 'death' as the Green Goblin...at least from Jonah's perspective. 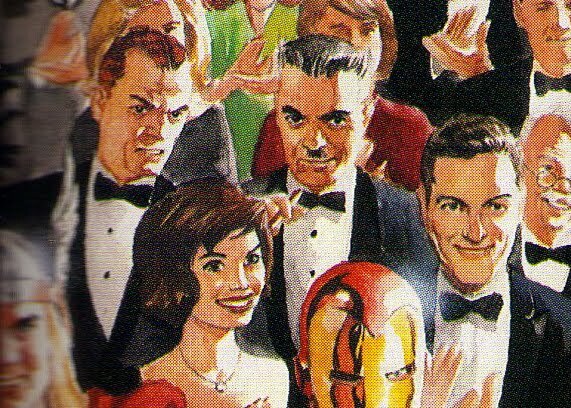 Norman made numerous unofficial cameos in the early issues of Amazing Spider-Man, this panel is from Amazing Spider-Man #23. As Jameson offers up a little self-gratuity, Norman is front-and-center amongst the elite group listening in. This scene took place at their infamous gentlemen's club, later named officially as The Century Club. 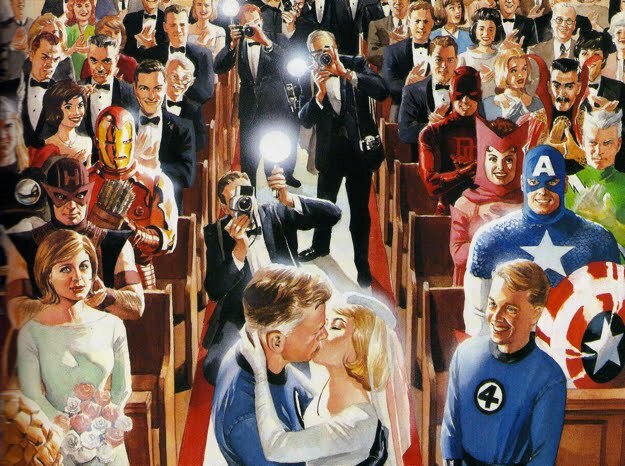 As depicted in Marvels #2, Norman and Jonah both attended Reed and Sue Richards' wedding...let's just assume they went separately and just decided to sit next to each other. Obviously the two were very close friends and enjoyed each other's company. And if that wasn't a highlight in Norman's life, then this occasion has to make the list. 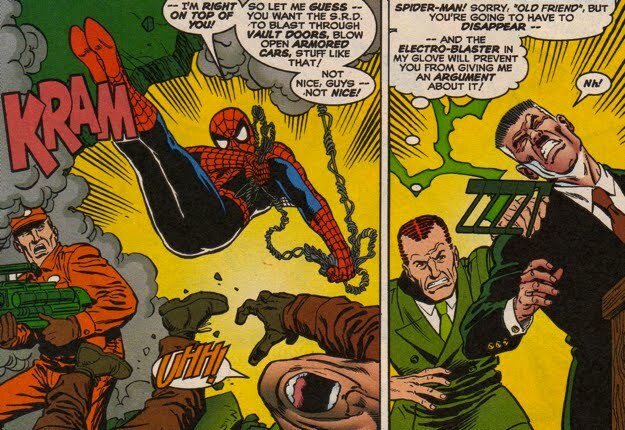 In Untold Tales of Spider-Man #25, Norman double crosses his ally the Crime Master by convincing him that the alter ego of the Green Goblin was the Daily Bugle Publisher J. Jonah Jameson. 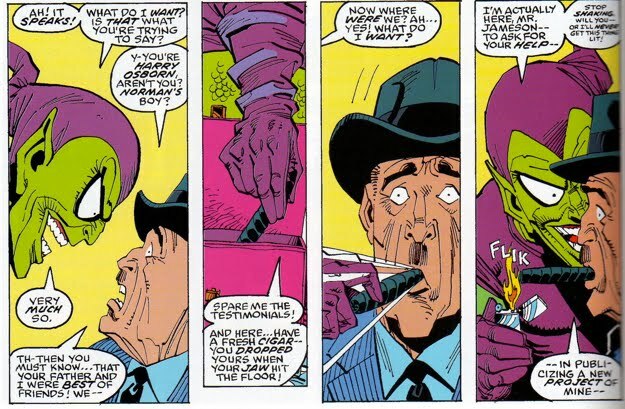 The Crime Master wanted the Green Goblin to unmask himself as a sign of trust between the two. Norman framed his close friend for being the Green Goblin and The Crime Master bought the rouse lock, stock and barrel. 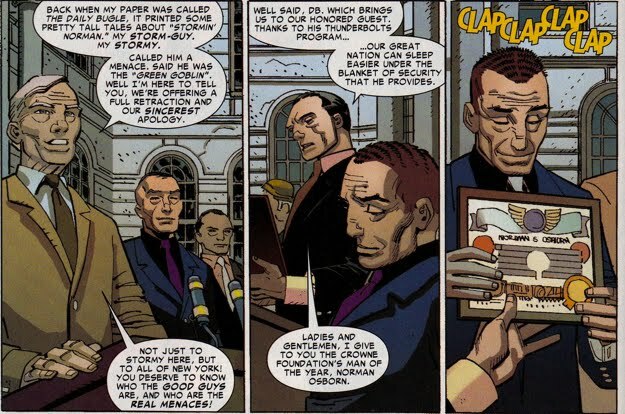 Later on in that same story, Jameson and Osborn dedicate some new technology during a ceremony at Norman's alma mater E.S.U. 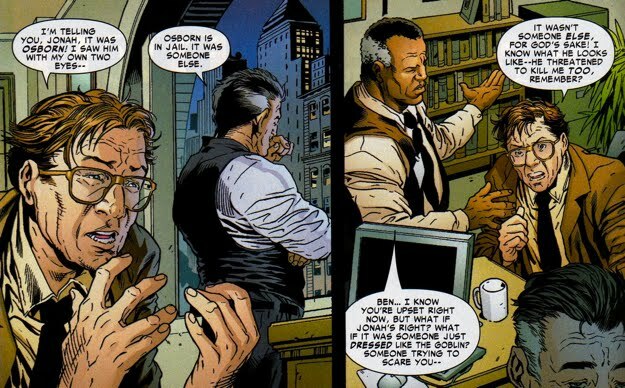 Osborn exhibits a complete lack of respect for Jonah as he thinks to himself that the publisher is 'empty noise'. 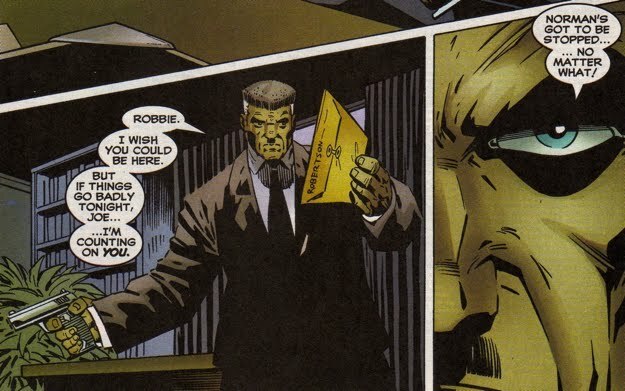 It is possible that somewhere deep within Norman's conscious he appreciated Jonah as a friend and that Osborn was so immersed in his Goblin persona that his cynical nature dominated. But if you make that argument, then you have to acknowledge that at this point in time Norman was immersed in his Goblin persona 24/7 so any show of friendliness toward Jonah must have been a farce. 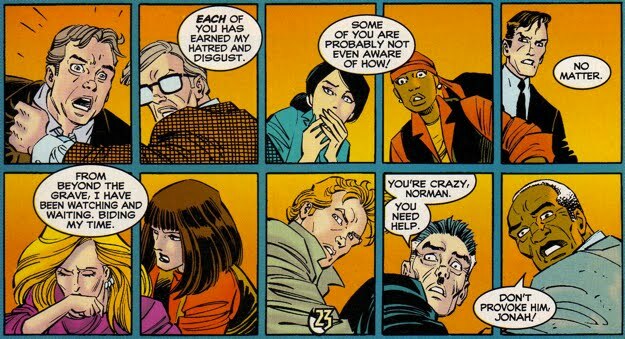 Same issue, here Norman's reference to Jameson as an old friend is written in quotations marks by the author Kurt Busiek. This reads to me as Busiek demonstrating that Osborn did not respect Jameson nor did he believe that they were truly friends. To add insult to injury (literally), Norman shocks Jameson using the electro-blaster in his glove, knocking Jameson out cold. Of course it would not take long for Norman's buried memories to resurface and the mere mention of Spider-Man and/or the Green Goblin disrupted Osborn's mood. 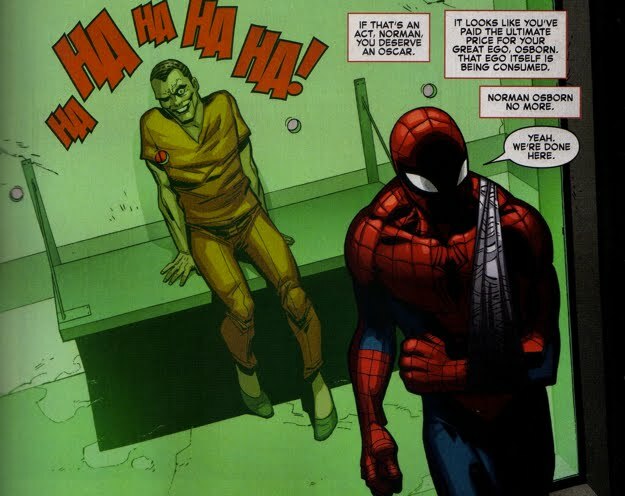 In Amazing Spider-Man #62, Jameson is caught off-guard after Osborn lashes out at him while in the midst of his Goblin-relapse. Once again, more fun had at The Century Club. 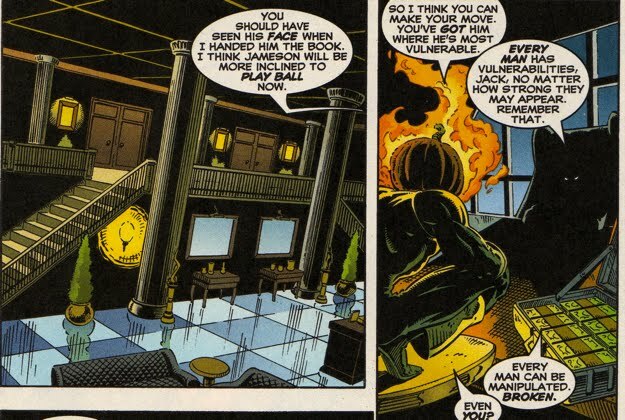 Two interesting things from these panels from Amazing Spider-Man #62, which continue the conversation between Osborn and Jameson at their executives club (aka the gentlemen's club, aka The Century Club). 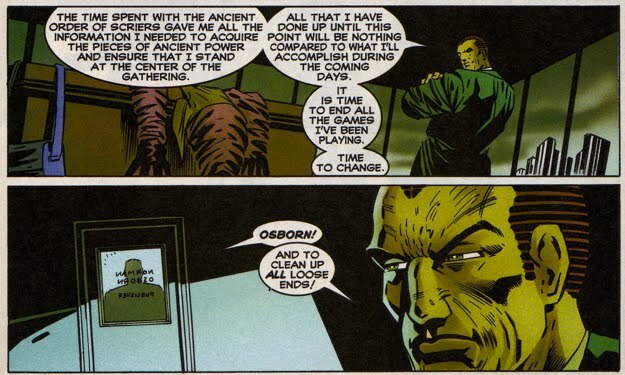 First, Jameson refers to Osborn as 'one of the richest men in town', this provides some concrete perspective as to Norman's financial status at this point in time. Second, Jameson exhibits some non-altruistic behaviors toward Norman citing that he'd like to help Norman because they are friends AND there might be a story in it for him! Wow, okay, so perhaps both of these guys exploited their friendship with the other for personal gain, it may not be as lopsided as previously thought. Norman's mood swings and headaches culminate in a full fledge flip-out in Spectacular Spider-Man Magazine #2 as he madly rushes out of a seminar given by Captain George Stacy on the History of Super Villains. 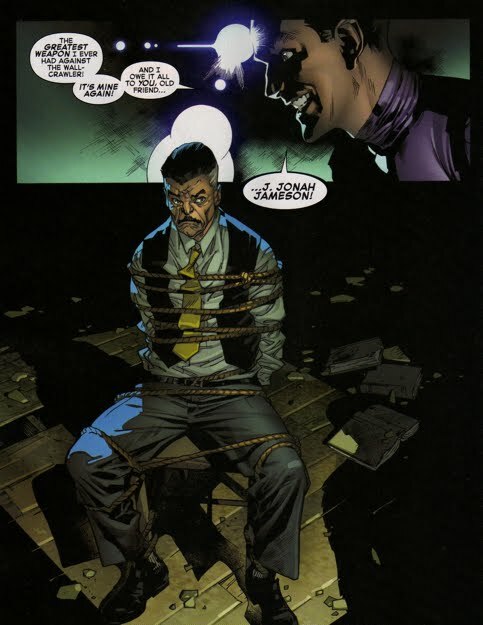 This incident occurred in the presence of J. Jonah and it represents another example of suspicious behavior by Osborn that Jameson would have had to actively ignore in order to believe that Osborn was a normal and balanced mentally. 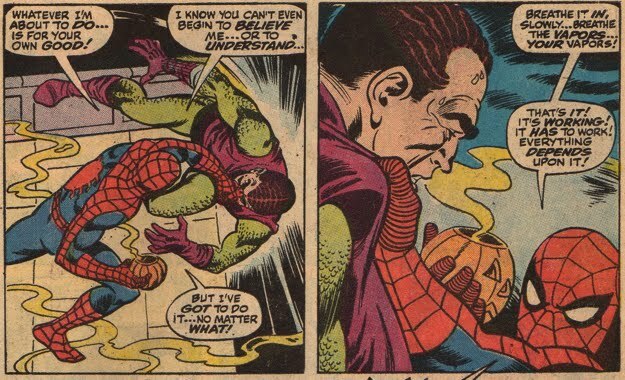 Osborn's recollection of his past as the Green Goblin ignites another brutal confrontation with the web-slinger. 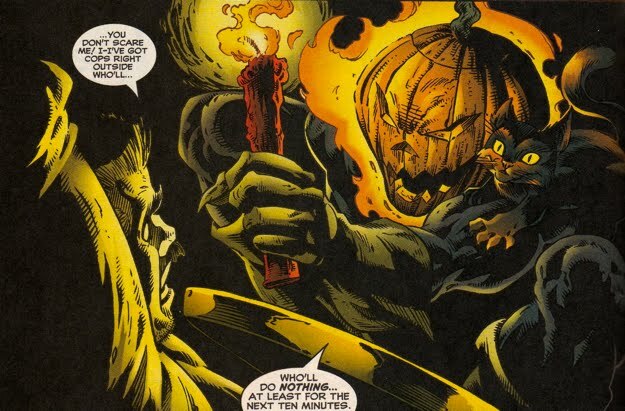 The result is yet another amnesiac spell for Osborn, this time courtesy of one his own hallucinogenic pumpkin bombs. Once again Norman enters a brief period where he has no recollection of his alter ego and he most likely behaved like a normal friend for Jonah. This is where the story gets a little dicey. 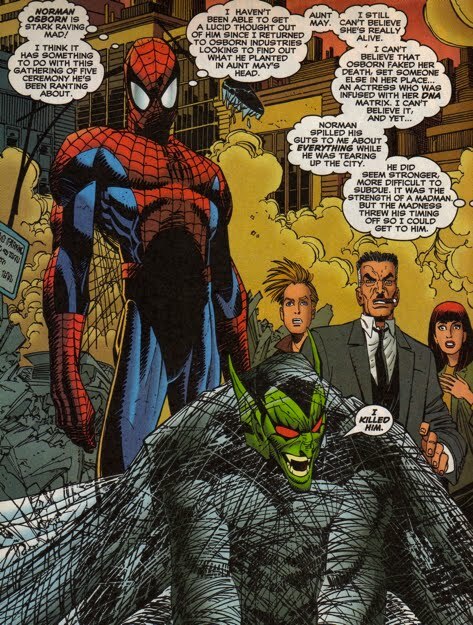 For a synopsis on Norman's eventual outing as the Green Goblin by Ben Urich, click here. 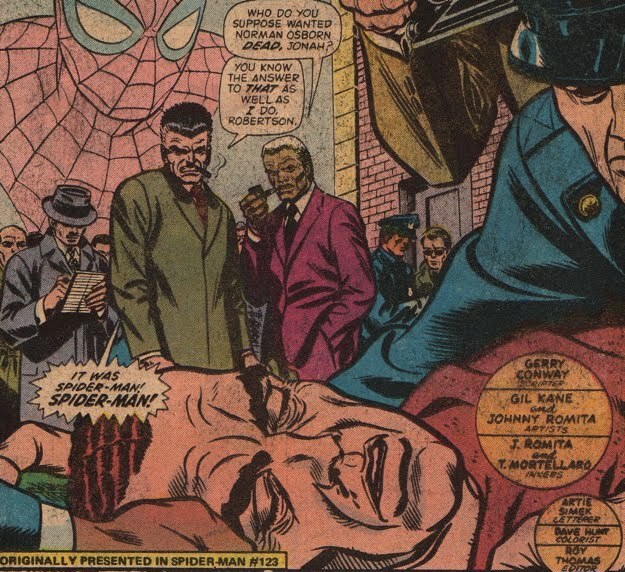 Keeping it strictly from J. Jonah's perspective, we turn to Amazing Spider-Man #123 where the publisher observes Norman's 'deceased' body being hauled away by the authorities. 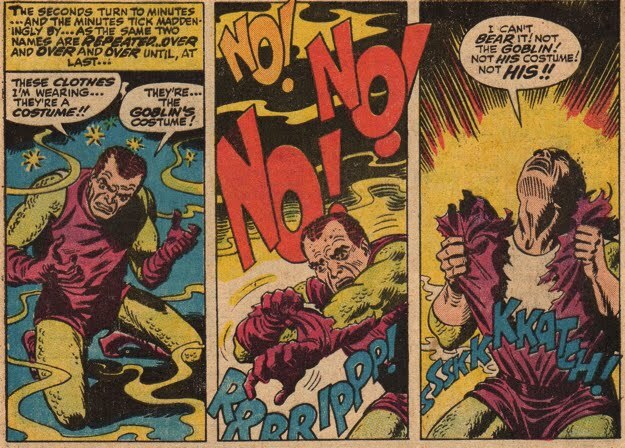 Of course Norman was 'killed' after being impaled by his Goblin Glider in Amazing Spider-Man #122, but Harry had stripped away his father's Goblin attire making it seem as though Norman died a victim. 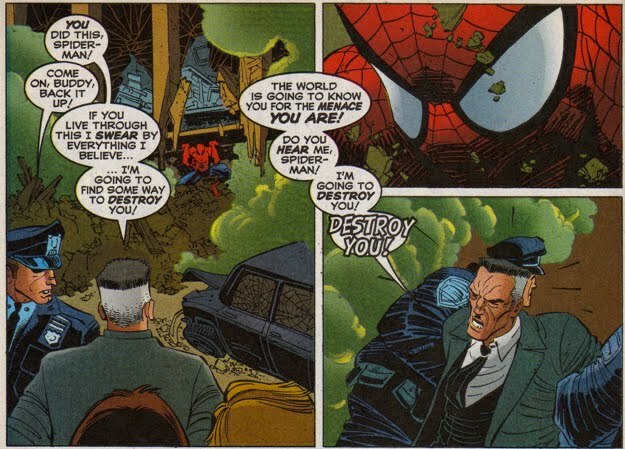 Jameson immediately faults Spider-Man for Norman's death and he vows to bring Spider-Man to justice. 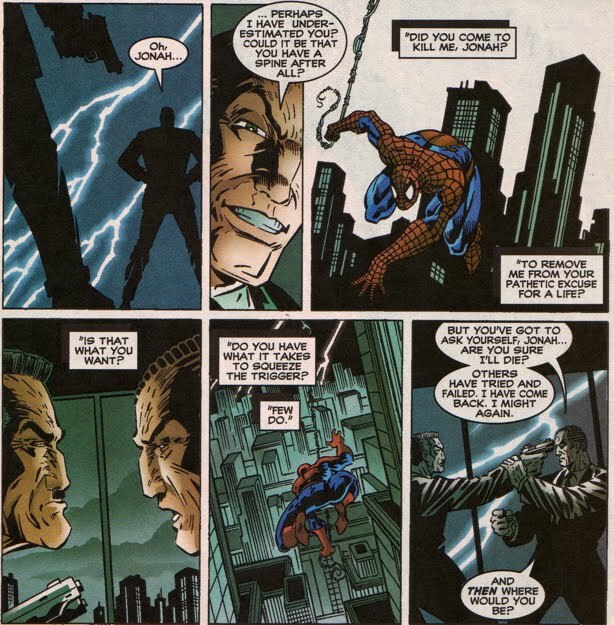 The following panels, also from Amazing Spider-Man #123, demonstrate a pattern of behavior in which Jameson continued to actively ignore the circumstantial evidence linking the Green Goblin to Norman Osborn. 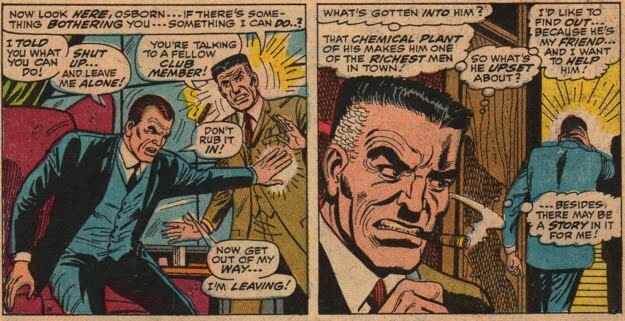 The policeman points out the various pumpkin bombs found at the scene of the crime, but Jameson dismisses them as a plant because he's so dead-set on Spider-Man's guilt. 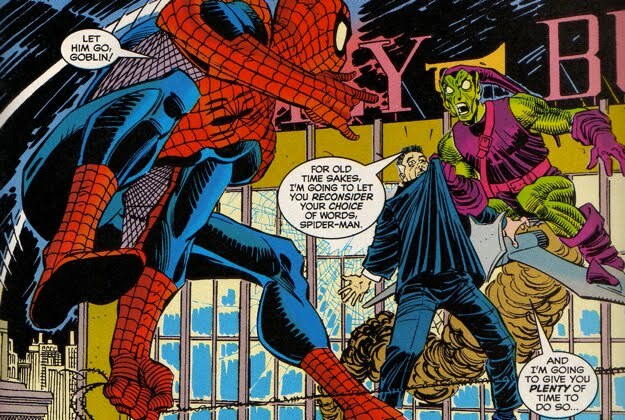 If Jameson had not been so blinded by hate toward Spider-Man, he may have been able to put two-and-two together between Osborn and the Green Goblin. Recall that back in Amazing Spider-Man #62 Jameson was curious as to the nature of Norman's strange behavior and he was even prompted to investigate. Did he really investigate? Because if he did, you'd think that this would be a big piece of evidence. Maybe he did investigate and the truth was too much, so he actively suppressed the fact that his 'friend' could be a costumed criminal. Jameson would later send Luke Cage after Spider-Man in order to bring the web-slinger to justice, but to no avail. This is ironic because later we will see (on two occasions) Luke Cage would play a pivotal role in busting Norman Osborn, not Spider-Man! Couple of interesting things from this sequence in Amazing Spider-Man #124. 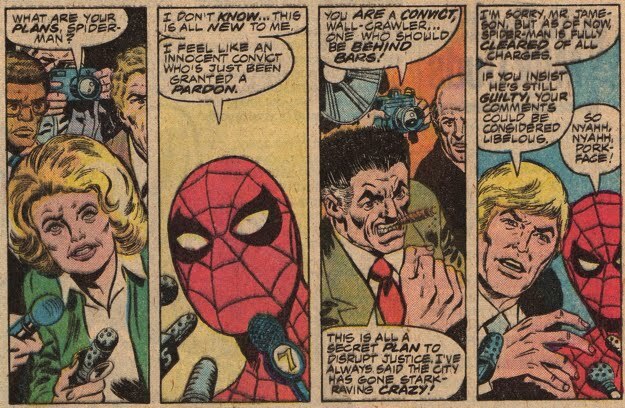 First, there was some unbiased journalism going on in New York City from the Herald-Star, which did not fault Spidey for the death of Osborn and even cited the Green Goblin as a potential suspect. It would interesting to see if the journalist that wrote that story for the Herald-Star had any theories as to the identity of the Green Goblin. Second, Jameson explains his personal ties to this case to Joe Robertson as he states that Osborn was 'a friend' and that finding the murderer has a deeper significance than a mere story. 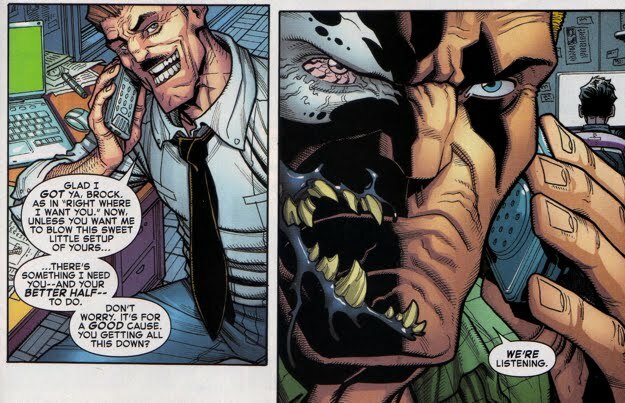 Regardless, Jameson's crusade against Spider-Man as the murderer of his close 'friend' Norman Osborn was quickly derailed by his son's conversion to the Man-Wolf. Suddenly, Norman's death was significantly less important to Jonah. Despite Jonah's consistent attacks on the web-slinger via the Daily Bugle, Spidey still manages to find some time to save Jonah's son, John. Unfortunately, Jameson was not very appreciative and in Amazing Spider-Man #125-126 he switches his crusade against Spider-Man from finding Osborn's murderer to finding the person responsible for John's condition. Either way, Jameson wanted Spider-Man brought to justice...but that would have to wait. 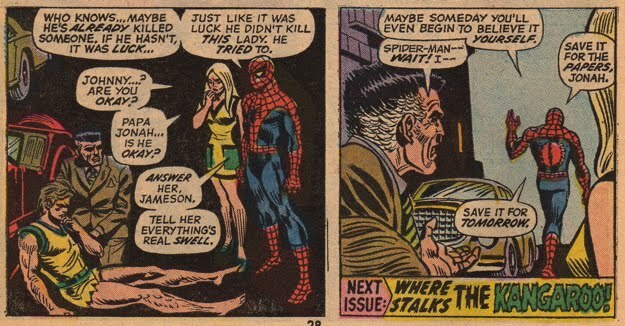 Another example of convenient amnesia displayed by Jameson occurs around the time Harry was hauled off by the authorities as a raving lunatic claiming to be the Green Goblin. Obviously Harry's testimony had zero credibility in the eyes of the police, however, it seems very likely that the news of Harry being taken into custody would have eventually made its way to Jameson. 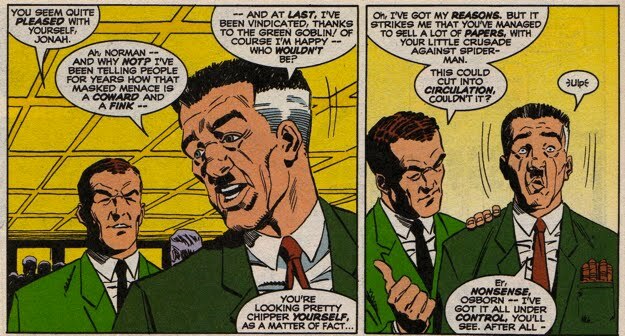 Despite the lack of concrete evidence linking Harry to the Green Goblin, the circumstantial evidence of his claim to be the Green Goblin and the history between the Osborns/Spider-Man/Green Goblin should have raised a red flag to Jameson. Again, there's no official confirmation that Jameson was aware of this incident. Evenually, in Amazing Spider-Man #186 Spidey is exonerated from the charges against him in the deaths of both Norman Osborn and Captain George Stacy. As you can see in the second set of panels below, Jonah was not convinced of Spidey's innocence (big surprise!). Later, after Roderick Kingsley (aka the Hobgoblin) raided a slew of Norman's Goblin hideouts, he uncovered one of Norman's journals which contained blackmail-able information on numerous wealthy confidantes from Norman's past. 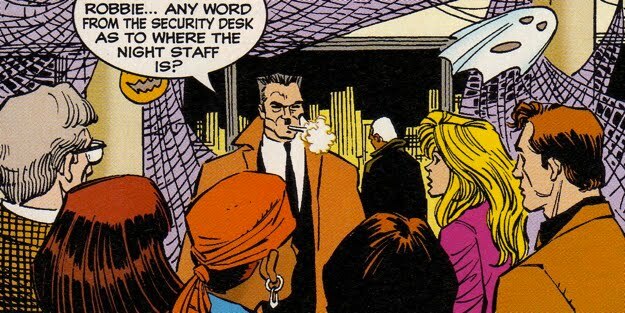 One of those wealthy confidantes...Mr. J. Jonah Jameson, who had told Norman about his involvement with the conversion of Mac Gargan into the Scorpion. 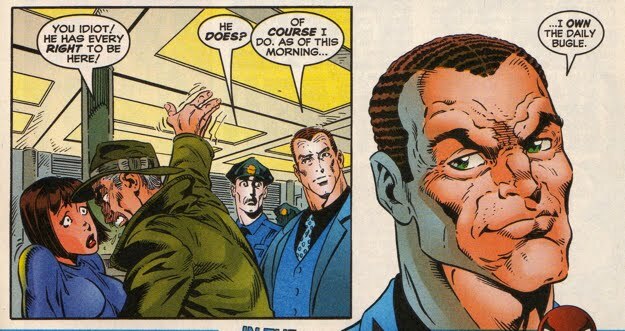 Jameson realized that his secret was out in Amazing Spider-Man #249. 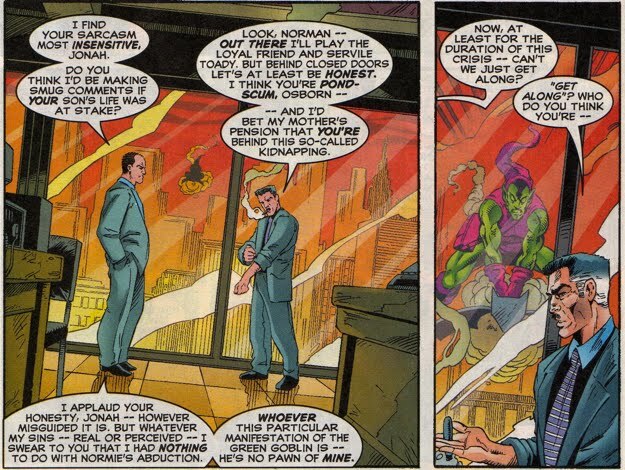 Also in Amazing Spider-Man #249, Jameson witnessed the extent of the Hobgoblin's blackmail after he observed the numerous club members that were being extorted as well. 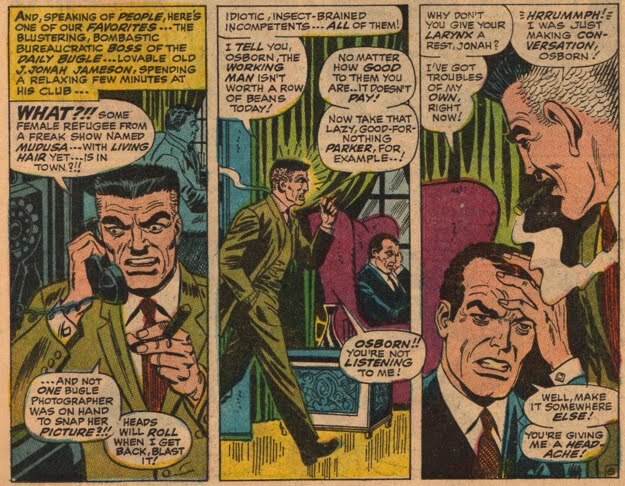 Although it should be noted that Jameson assumed it was Harry who was leaking the information because the Hobgoblin had not arrived yet on the scene. The take home point from a panel like this is that amongst the aristocratic elite at the executive's club, Norman had to have been a like-able socialite for all these men to have confided in him. Norman, of course, repaid their trust by diligently recording all their secrets to use as blackmail at some point down the road...little did Norman know that the Hobgoblin would beat him to that. 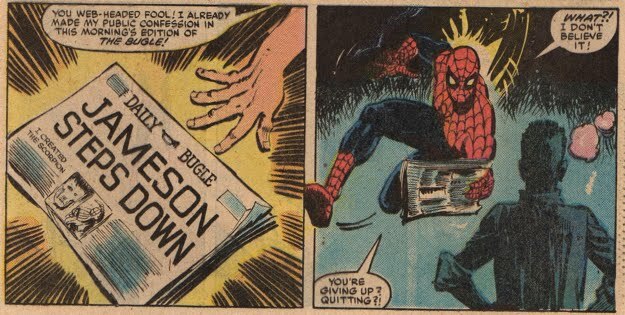 The pressure put on by the Hobgoblin eventually caused Jameson to step down from the position of Editor in Chief at the Daily Bugle in Amazing Spider-Man #251. 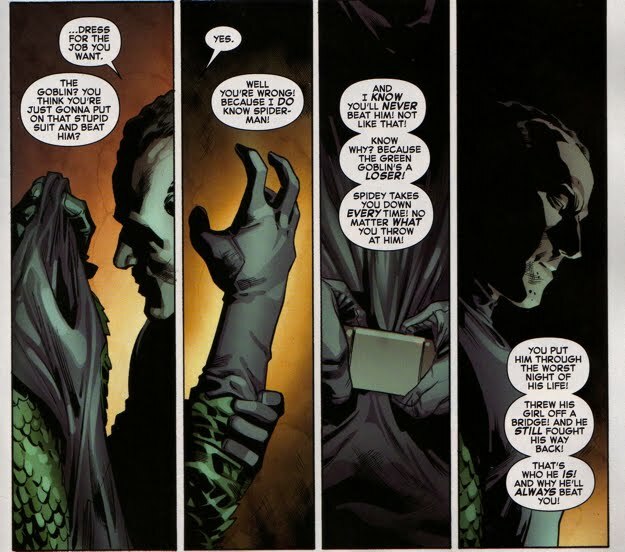 So there you have it, a secret confided in Norman Osborn led to Jameson's voluntary departure from the Bugle, a position that was certainly dear to his heart. 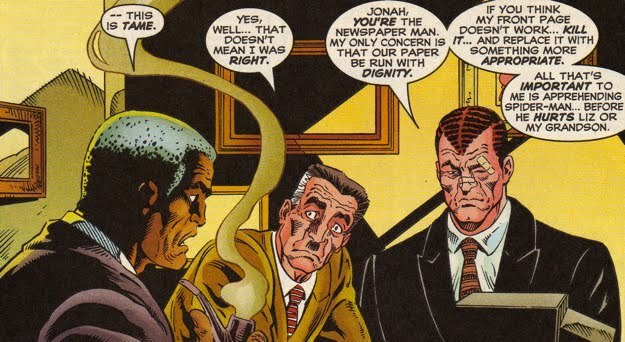 That has to make you think what were Jonah's thoughts on Osborn at this point, why would Norman have kept a record of Jameson's transgressions? Did Jonah still believe he was a true friend? 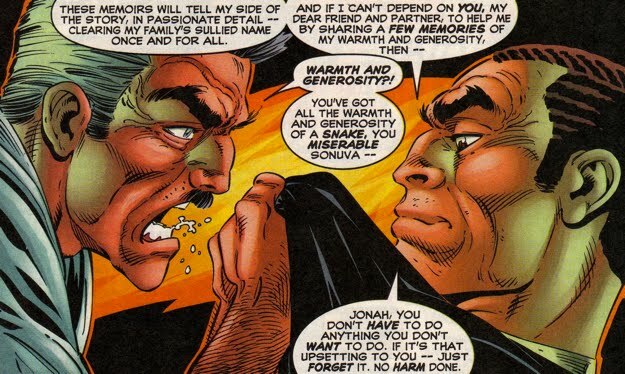 Some time later in Spectacular Spider-Man #189, an extraordinarily significant event occurred in the relationship between Jonah and Norman...and it did not involve either of them. Harry Osborn was arrested by the authorities and carted away as the Green Goblin for all to see. 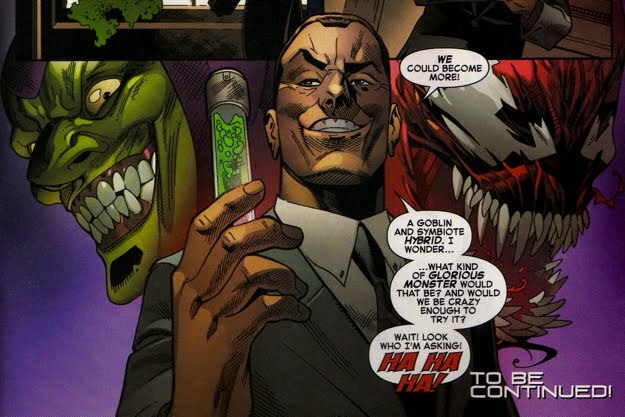 This represents the first indisputable link between the Green Goblin and the Osborn family. Jonah may have still been in denial about his old friend, but he could not deny Harry's descent into Goblin madness...so was Jonah beginning to think that Norman must have been the Green Goblin as well?? 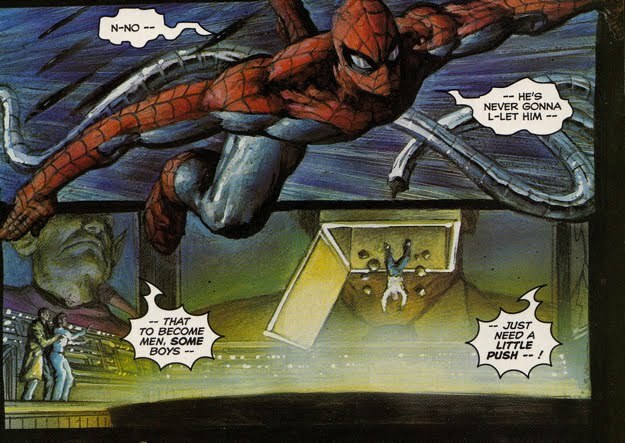 If the events of Spectacular Spider-Man #189 were not enough to convince Jonah, then perhaps Harry's public death (as the Green Goblin) in Spectacular Spider-Man #200 was enough to cause Jonah to see the light. Recall that Harry's death occurred while he was trying to build a foundation to restore his father's sullied reputation, despite the fact that the accusations against Norman had amounted to only 'vague innuendo and unfounded rumors'. Jonah would have had to wonder why Harry would have been so dead-set on restoring his father's name whilst parading around as the Green Goblin! I think Harry 'doth protest too much'...wouldn't ya say? So, had Jonah finally realized that Norman was the Green Goblin? See below. Sadly, Jonah was still not convinced that Norman was anything less than an outstanding citizen and father. 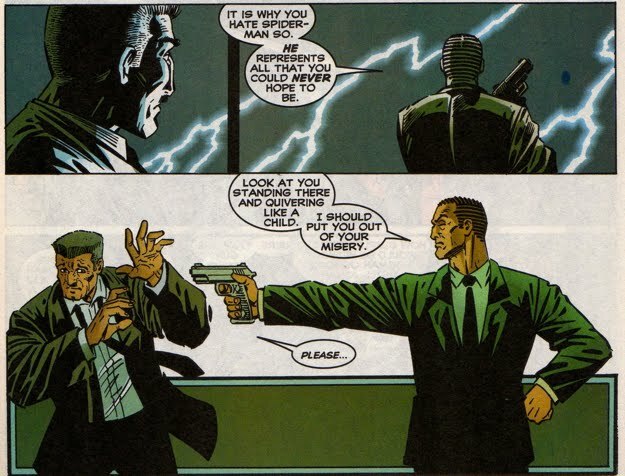 Jonah expressed that viewpoint to Ben Urich while the latter was involved in an investigation of the kidnapping of Norman's grandson, Normie. 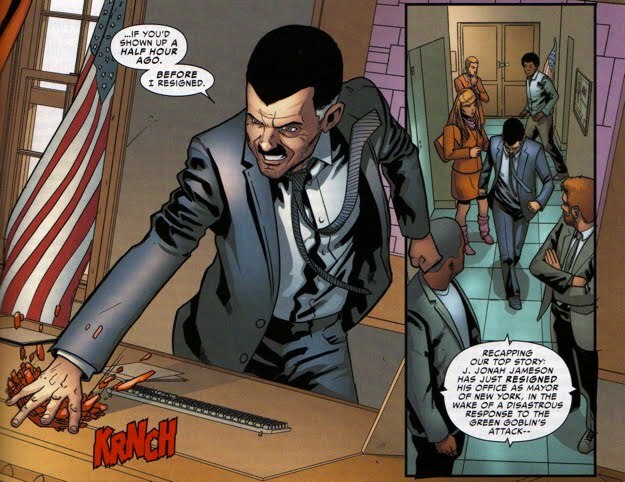 Urich interviewed a handful of former Osborn colleagues and friends and he listened Jonah's adamant defense in Spider-Man: Legacy of Evil. 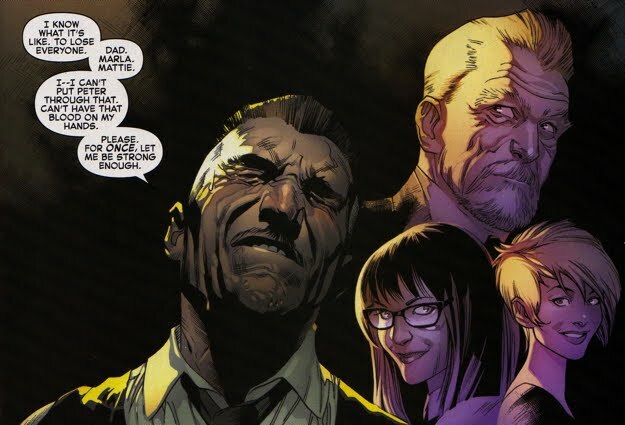 Urich would eventually witness first-hand the level of depravity that both Norman and Harry had reached when it was revealed that the kidnapping of little Normie was orchestrated by the Osborns in an attempt to pass their Goblin Legacy onto the youngest Osborn. 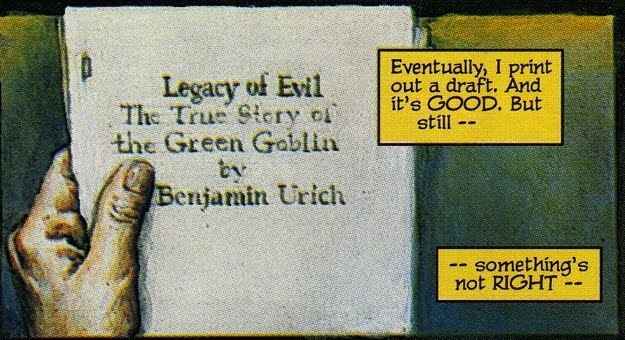 Urich would eventually out Norman as the original Green Goblin in his book Legacy of Evil and a draft of that piece made its way to Jameson. Urich's submission of his final draft over to both Jameson and Robertson represents another critical milestone in the relationship between Jonah and Norman. It would have been at that point that Jonah would have had no other choice but to accept the fact that his former 'close friend' was the murderous Green Goblin. Everyone knows that Norman was not going to let Urich have all the fun and after his return from exile, Norman made sure that he let Jameson (and others!) find out first-hand just how true those 'vague innuendos and unfounded rumors' actually were. He sent invitations to a group of people that included Urich, Flash Thompson, Liz Allan, Joe Robertson, Betty Brant, Glory Grant, and, of course, J. Jonah Jameson to join him at the Daily Bugle in Peter Parker Spider-Man #75...the invitees did not know who had send the invitations. 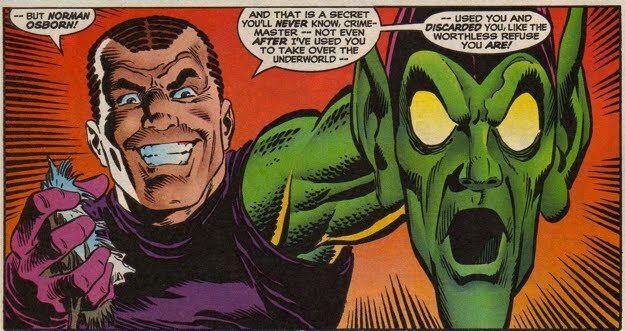 The following panel is the nail in the coffin for the Norman Osborn/Green Goblin debate as far as Jameson is concerned. It should be noted that Norman is almost surprised that Jameson remembers him...I thought they were very close friends?? So what are Jonah's thoughts on Norman at this point? Check out the panel below. Norman's attack on the Daily Bugle staff ended in a defeat at the hands of Spider-Man and once again Norman disappeared into the shadows, but he would soon return. 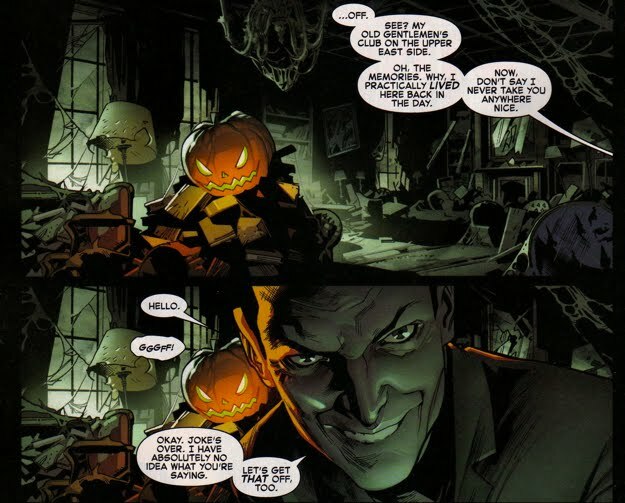 Norman's next wave of threats against Jameson were not carried out in person, in fact, he sent his henchmen the Jack O'Lantern to threaten Jonah's wife Marla in Spectacular Spider-Man #248. Jack stole a book of poetry which belonged to Marla and passed it over to Norman so that he could use it to remind Jonah of what he would do if Jonah fell out of line. Norman even forced Jonah into endorsing him publicly as Norman spearheaded a campaign to restore his (and his son's) soiled reputation by re-initiating the philanthropic Osborn Foundation. 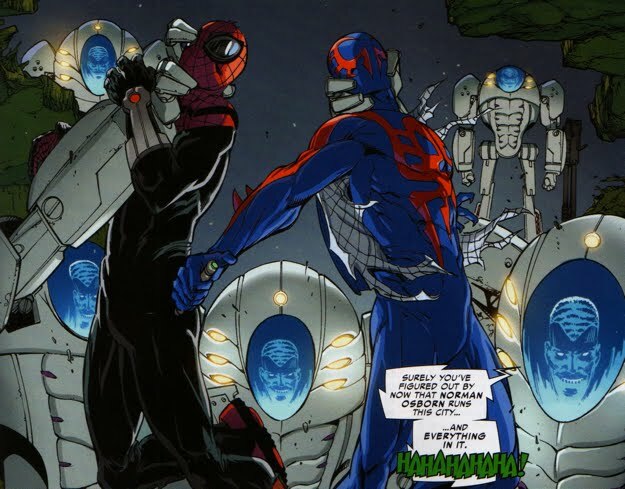 The following panel is from Spectacular Spider-Man #250. 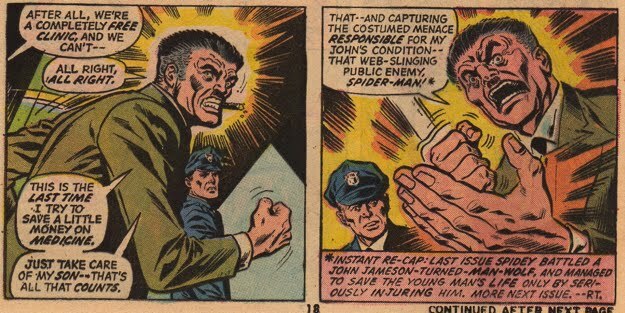 Of course Norman simply used the newspaper to exact his revenge upon Spider-Man by placing a large bounty on his head after an attack by Spidey against Norman was caught on tape and released publicly. 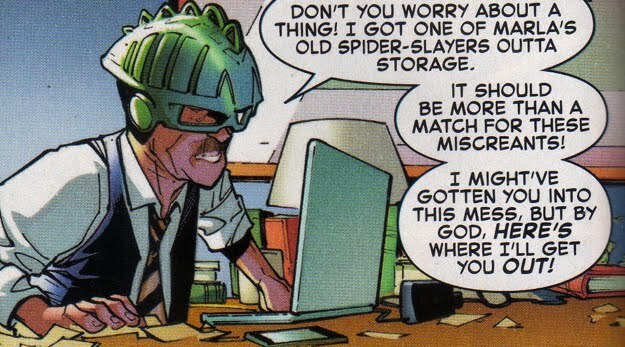 This panel from Spectacular Spider-Man #255 gives solid insight into Jonah's true feelings toward Norman. Its also worth mentioning that once again Norman lies straight-faced to Jonah here concerning Normie's kidnapping. 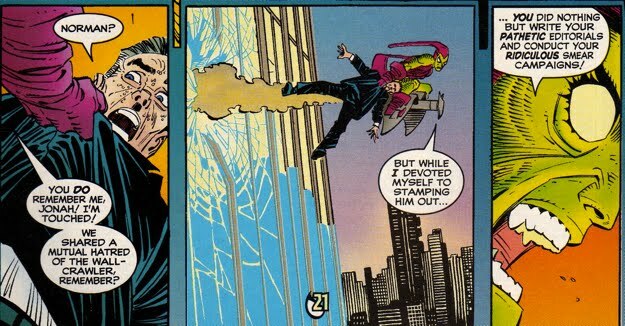 The following sequence of panels comes from Spectacular Spider-Man #256 and they illustrate the growing tensions between Osborn and Jameson as Norman continually upped the ante on his extortion of Jameson. Whenever Jameson had reached a saturation point for all that he could stand, he'd fly off the handle and attack Norman. However, Norman was able to force him back into obedience after reminding Jonah that his wife could easily become Norman's next victim. 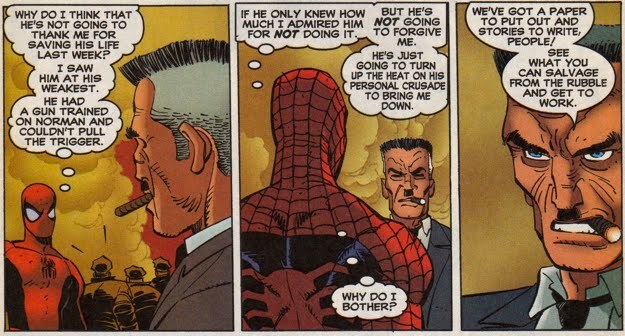 Even Peter chimed in on Jonah's despicable lackey-like behavior toward Norman, as seen in Spectacular Spider-Man #259. Jonah was beginning to crack. And after Peter had saved Norman (and Normie's) life in Peter Parker Spider-Man #95, Norman commanded Jonah to look after Peter. Jonah was a total pawn of Norman's at this point. As it turns out Jonah didn't have the stones to shoot Norman point blank and Norman was able to gain the upper hand. Luckily for Jonah, Spider-Man arrived to intervene and he stopped Norman from killing Jonah...believe it or not, Norman did have the stones to pull the trigger. I just want to add one quick thing about the following panel, that is, Norman's explanation for Jonah's hatred of Spider-Man. Norman is certainly an insightful guy (at times), but ironically, I think he hits the nail on the head for why he (not Jonah) hates Spider-Man...an intriguing panel nonetheless. Like all of Norman's plans and plots, his hostile takeover of the Daily Bugle fell flat on its face. 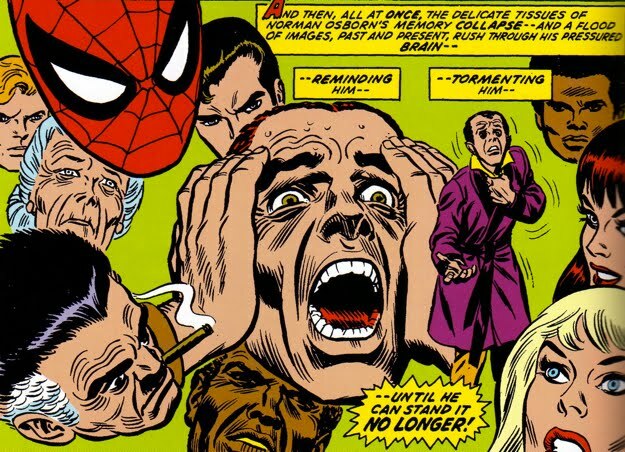 The events of the Gathering of Five left Norman a raving lunatic and he went on a destructive spree that left the Daily Bugle in shambles and the Green Goblin in an insane asylum. Luckily for Norman, he was not publicly outted (again) as the Green Goblin because loyal Scriers had rescued him before his secret could leak. So all the work Norman had done to debunk the theory that he was the Green Goblin seemed to hold, but Jonah (who witnessed Norman's downfall here) must have known the truth as he looked upon the webbed up (and insane) Green Goblin. What exactly happened to Norman's shares (ie, his part ownership) of the Daily Bugle? 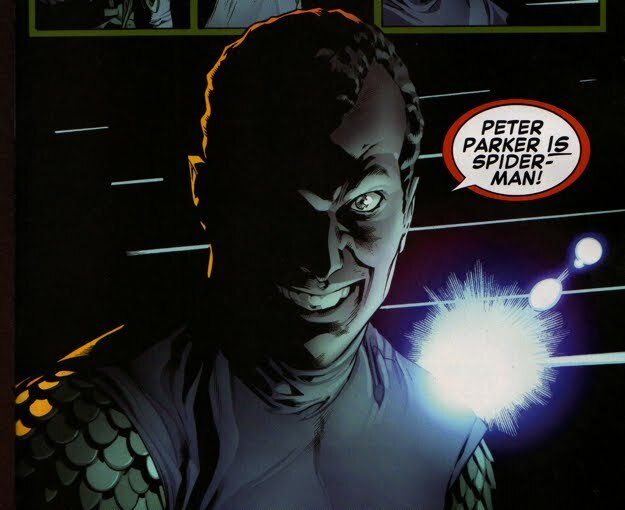 Did anyone realize the connection between the Green Goblin's public defeat and the disappearance of Norman Osborn from prominence? Was that not newsworthy from Jonah's perspective? 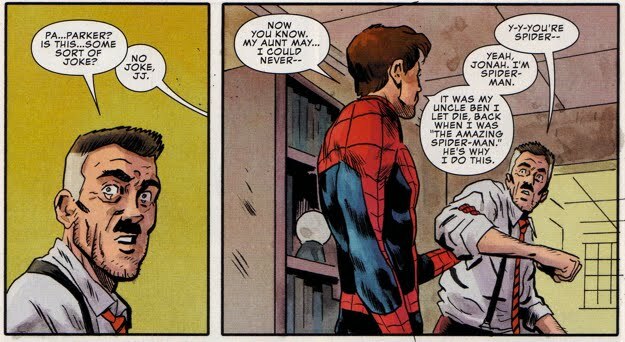 The following panel from Peter Parker Spider-Man #98 provides excellent insight into Peter's feelings toward Jonah in regards to the events of Peter Parker Spider-Man #96. 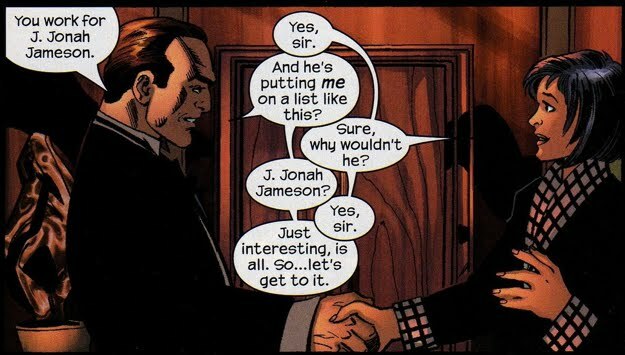 Notice how Jameson never cracks and returns to his 'all-business' persona without ever thanking Spidey. 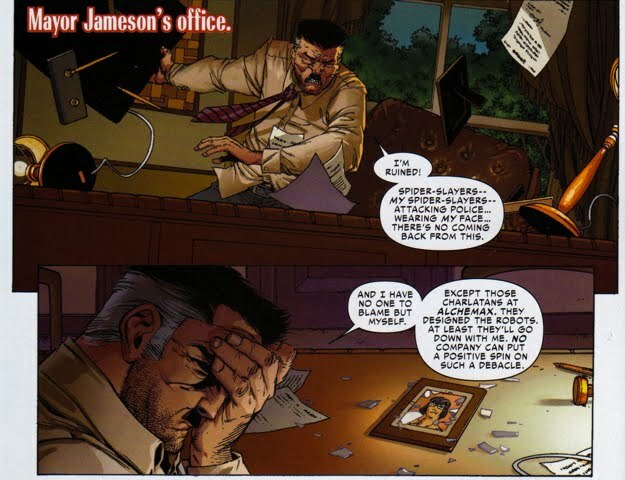 The predictable Jameson even returns to his anti-Spider-Man crusade despite having just witnessed the extent of the web-slinger's heroic capabilities...talk about a thankless job! Time would pass and eventually Norman's demons would overcome him once again as he began killing his own employees. 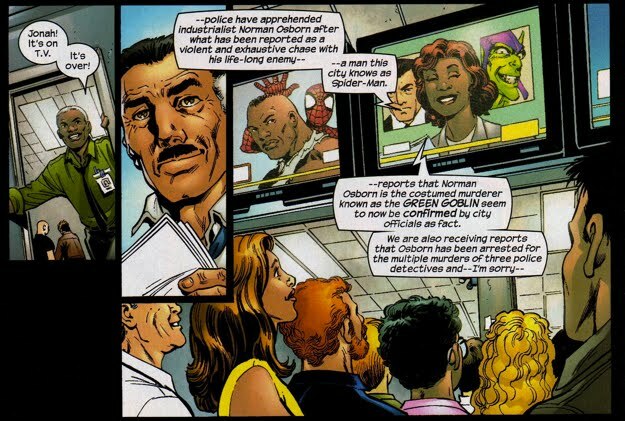 In The Pulse #2, Oscorp employee Sheryl Doser informs Daily Bugle reporter Terri Kidder that people have gone missing from Oscorp. 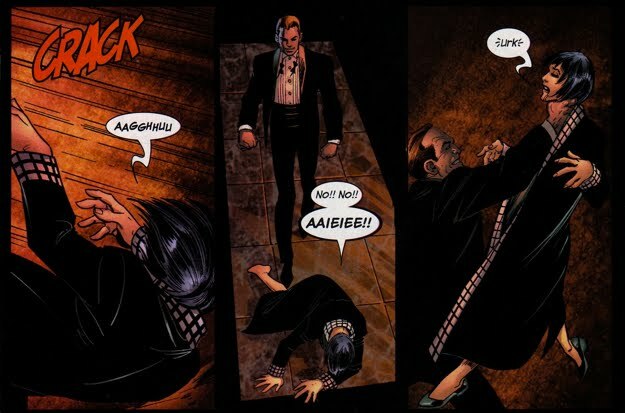 In order to get close to Osborn, Kidder falsely informs him that he has made the list of the 100 Most Powerful People in New York, a group that she is highlighting in a new story for the Daily Bugle. 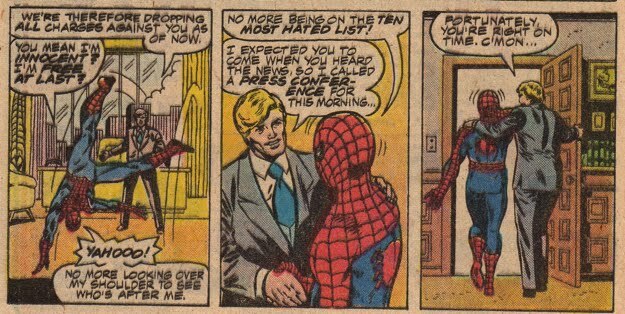 Norman, well aware of his history with Jameson, was surprised that the Daily Bugle would include him on such a list, but his ego got the best of him. During the course of her interview, Kidder tried to dupe Osborn into providing information on the missing persons. Norman doesn't fall for her trick and Terri Kidder pays for her mistake with her life. 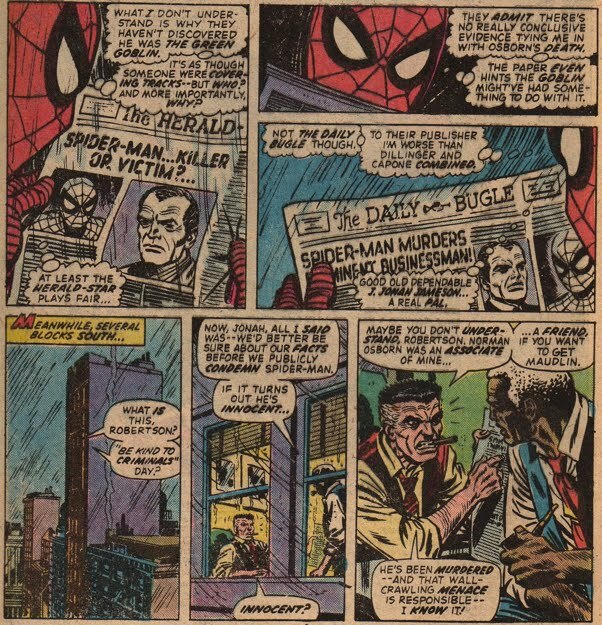 Norman kills the Daily Bugle investigative reporter in cold blood as seen in The Pulse #2. 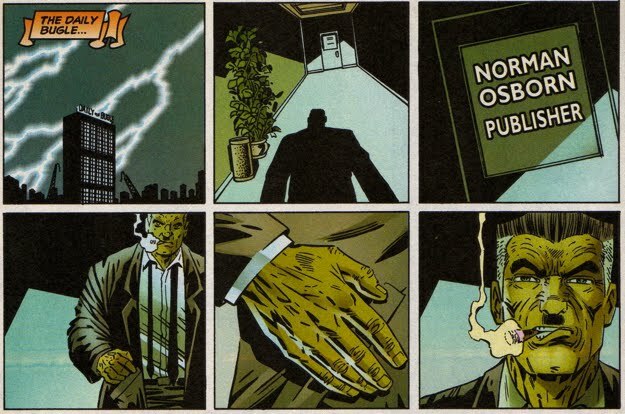 After being confronted by Ben Urich with evidence of Norman's horrific behavior, Jameson was forced to deal with the consequences that his former 'close friend' is the murderous Green Goblin. Technically, Jameson should not have required any convincing for this fact, perhaps he just did not want to relive the pain from a few years prior when Norman's actions almost caused Jonah to be a murderer as well. 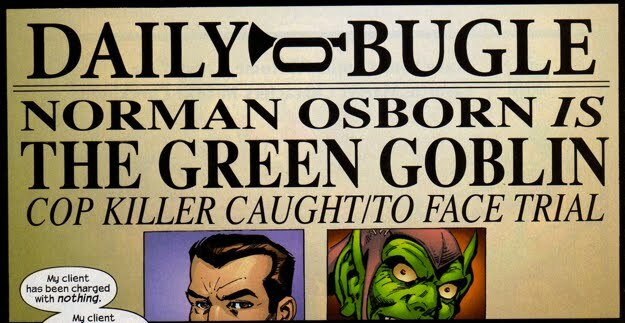 In The Pulse #5, The Daily Bugle staff reveals to the world (once again) that Norman Osborn is the Green Goblin. Despite the fact that Norman had debunked Urich's Legacy of Evil as a credible source, he was unable to prevent this story from dealing a crippling blow to his legitimacy...for now. 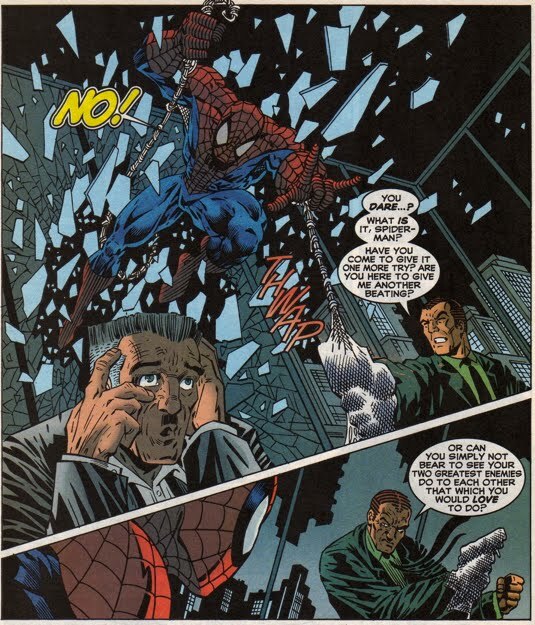 Recall that Luke Cage was hired by Jameson to track down Spidey for his role in the death of Norman Osborn. Well, ironically, Cage had a hand (or fist) in bringing Norman into custody after being outted as the Green Goblin...its all cyclical. 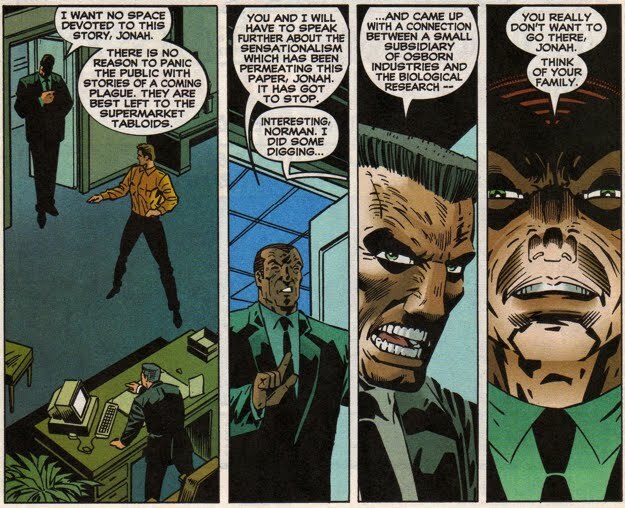 As the following panels demonstrate, J. Jonah Jameson was not only integral in Osborn's public downfall, but he took an immense amount of pride in doing so. 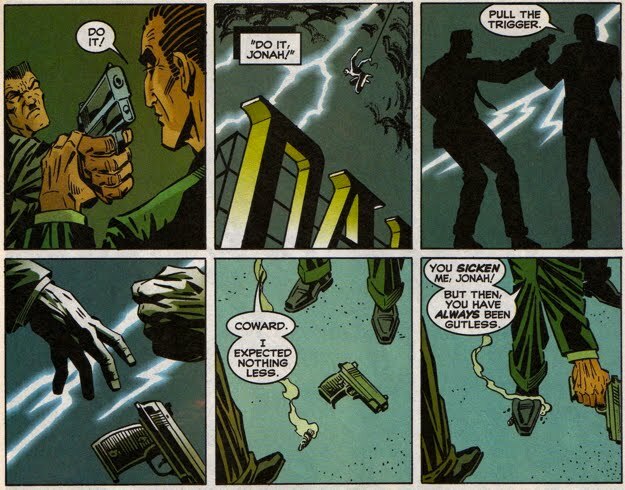 This sequence of panels is from The Pulse #5. 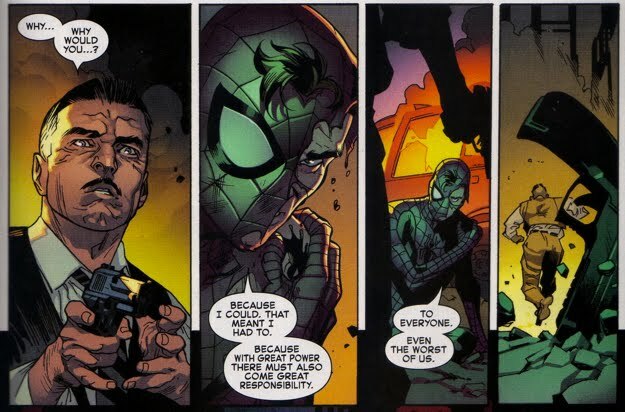 Even Peter Parker (after his public unmasking as Spider-Man) reinforces the fact that Norman Osborn was a terrible person when he added more damning testimony to Norman's foul ways in Civil War Front Line #2. 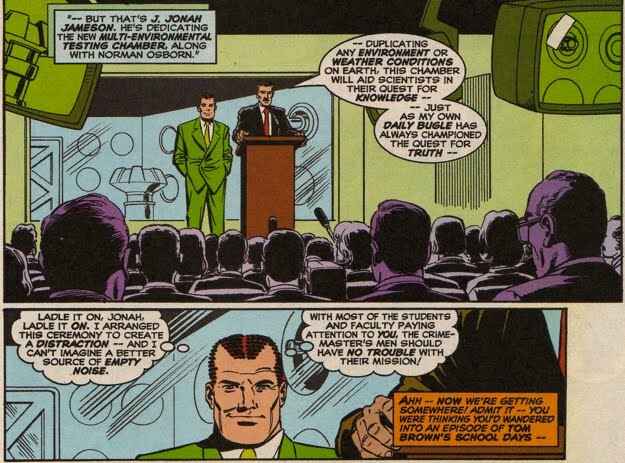 Of course, in the post-Brand New Day Spiderverse it is difficult to imagine what people would remember from a press conference like this (since his unmasking was magically reversed), however, the general public had to be well aware of Norman's alter ego (despite their cluelessness regarding Peter Parker's alter ego). As we all know, it's difficult to keep a good villain down and the Green Goblin is certainly no exception. 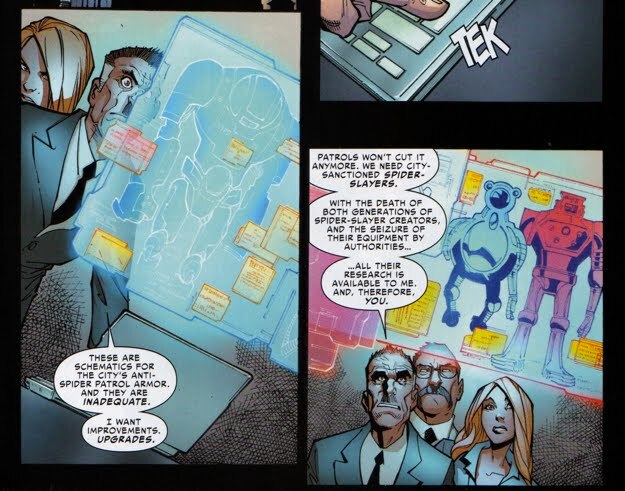 During the Superhuman Civil War, Ben Urich was attacked (but not injured) by the Green Goblin and he immediately informed his superiors in Civil War Front Line #5...they were not convinced. 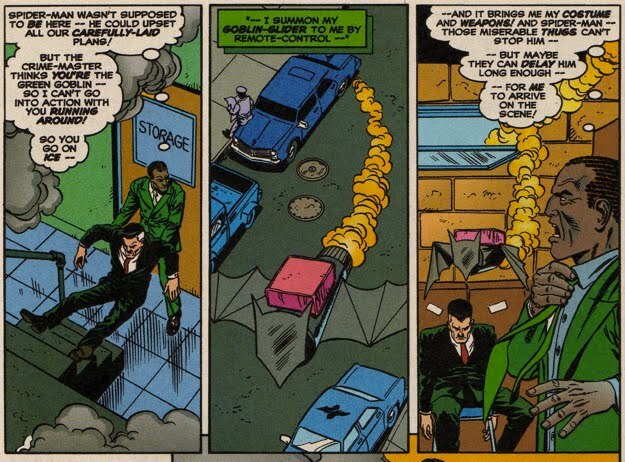 As Urich recalls his encounter with the Green Goblin, he mentions that he was only spared because the Goblin appeared to lose control of his body as he crashed to ground. 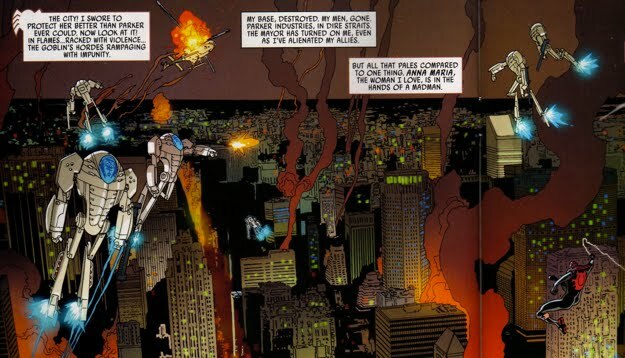 We later find out that Norman was a pawn under the employ of Tony Stark, sent out to wreak havoc and garner support for the pro-registration side of the Superhuman Civil War. 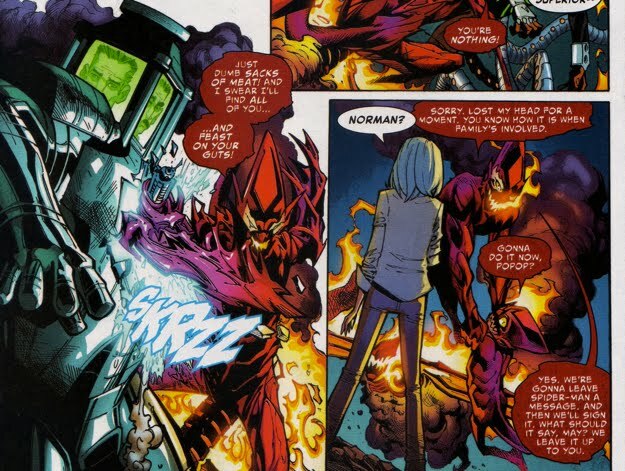 Nanobots had been inserted into Norman's body, giving Stark the power to 'shut down' the Goblin when necessary. For a more thorough rundown of this sequence of events click here. 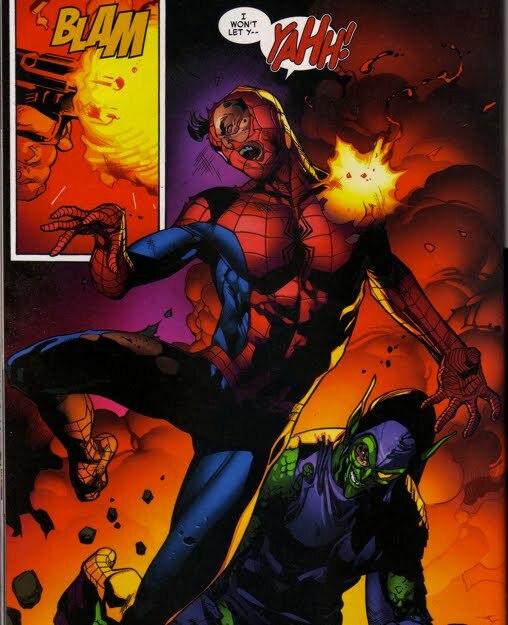 Later in Civil War Front Line #11, Ben Urich and Sally Floyd confront Stark for his role in manipulating Norman Osborn into reprising the role of the Green Goblin. Osborn's willingness to partake in Stark's political maneuver lands him a great gig...the Director of the Thunderbolts program. It seems Norman was back on the legitimate side of the law...bad news for Jameson. Soon after, health concerns caused Jameson to sell off the Daily Bugle to publisher Dexter Bennett (who renamed the paper the DB!). 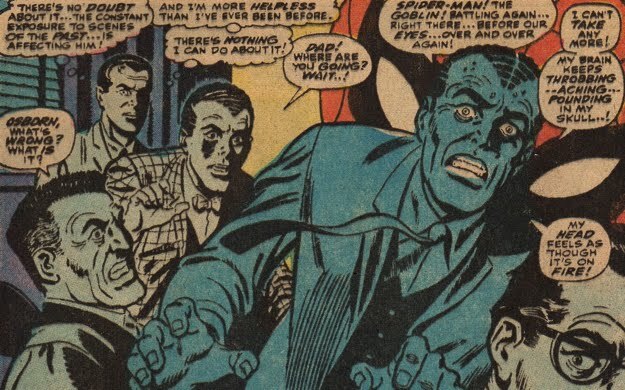 One of Bennett's first orders of business was to retract the previously published Daily Bugle story that Norman Osborn was the Green Goblin (can you really retract a news story that millions of people witnessed on TV just because you want to?!?). To add insult to injury, Randall Crowne awards Norman with the Crowne Foundation's Man of the Year award as seen in Amazing Spider-Man #569. 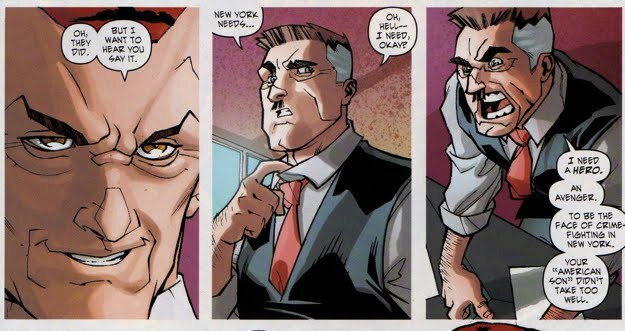 Things improved Jameson as well though, as he was (unexpectedly, at least from Spidey's perspective) elected mayor of New York City in Amazing Spider-Man #591...wait, what? Norman's ascension up the ranks of governmental agencies did not end with his role as the Director of the Thunderbolts. After the events of the Skrull's Secret Invasion, Norman's kill-shot on the Queen Veranke landed him in charge of national security. Norman was the new Nick Fury, a level of legitimacy that he could have only dreamed of reaching and as America's new top cop, a lot of people switched their demeanor toward him. 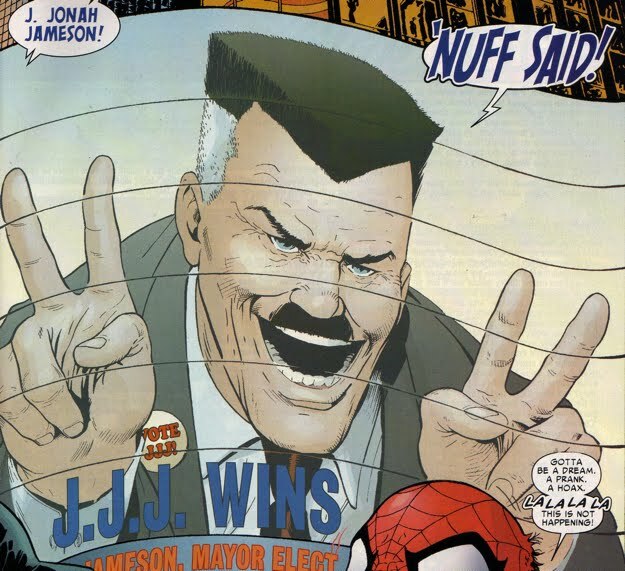 One of those people happened to be New York City's mayor, J. Jonah Jameson. 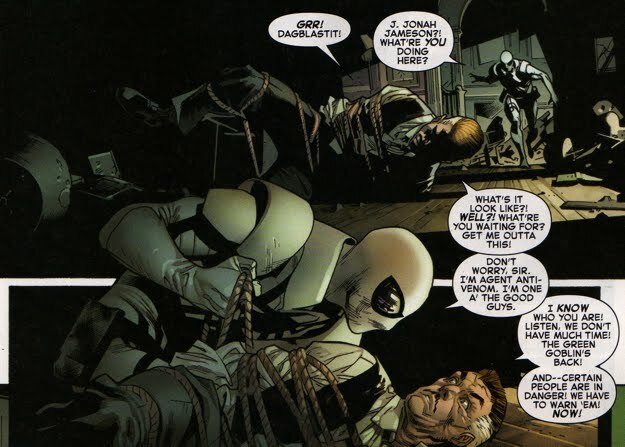 In an unprecedented show of extreme cowardice and amnesia, Jonah welcomes Osborn at Gracie Mansion with open arms in Amazing Spider-Man #595...wait, what? In my opinion this is one of the most out-of-character moments Jonah has ever displayed and quite frankly it cheapened the rich history between these two characters. At least J. Jonah Jameson Senior (Jonah's father) had the stones to stand up to Norman as the group's dinner plans fell flat on their face. As crime levels reached record highs in New York City, Mayor Jameson was forced to request the services of Norman's Avengers in Dark Reign: Sinister Spider-Man #2. Norman obliged. However, instead of giving Jameson Ms. Marvel, Norman decided to hand over his Spider-Man (aka Mac Gargan) to become the face of crime fighting in New York City. 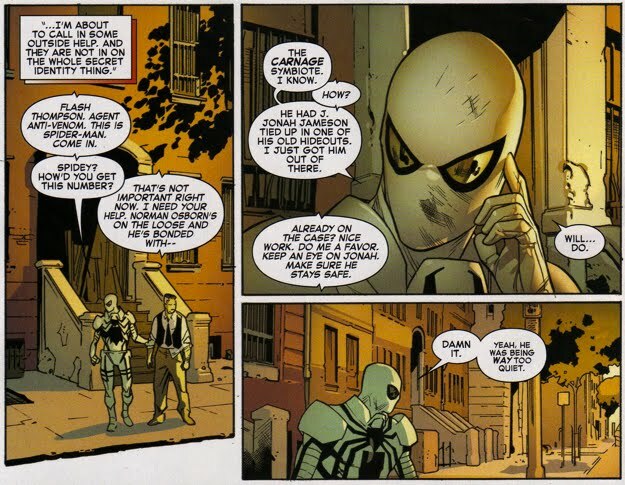 Gargan, who also shared a nice little history with the Mayor as well, was one of Jameson's earliest creations to defeat Spider-Man...the Scorpion. As one might expect, the pact between Osborn/Jameson/Gargan ended as quickly as it began after Gargan proved too reckless to be New York City's protector (d'uh!). Jameson broke his alliance with Norman and the two have not spoken since. 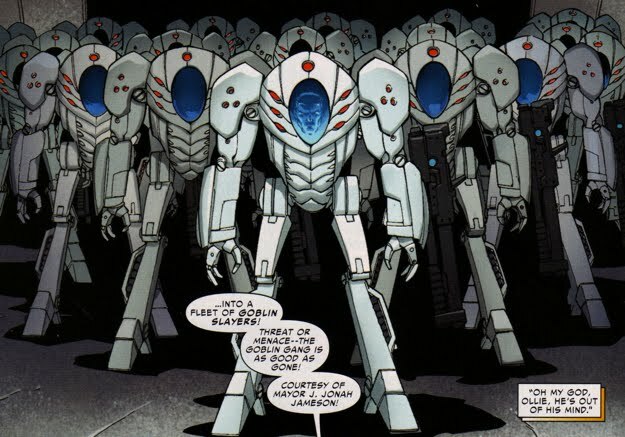 Of course, Norman's reign of terror as the leader of both the Avengers and H.A.M.M.E.R. eventually came to a screeching halt as he currently resides in Federal custody. Norman eventually escaped custody and made a second run at leading an Avengers team. That effort was more fruitless than his first attempt and after a meltdown using the Super-Adaptoid tech, Osborn ended up in a coma at Columbia University Medical Center. Miraculously awaking from his coma, Norman went through face-altering surgery, changed his name to Mason Banks and began a new campaign as the Green Goblin. As Mason Banks, Norman orchestrated the Allan Chemical takeover of Oscorp creating a new company called Alchemax. 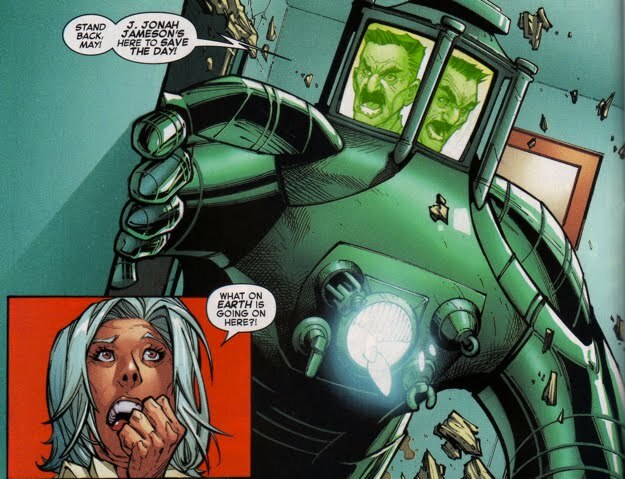 Liz Allan, manipulated by Norman, brokered a deal with Mayor J. Jonah Jameson involving the construction of Spider-Slayer-inspired robots for use in crime fighting. 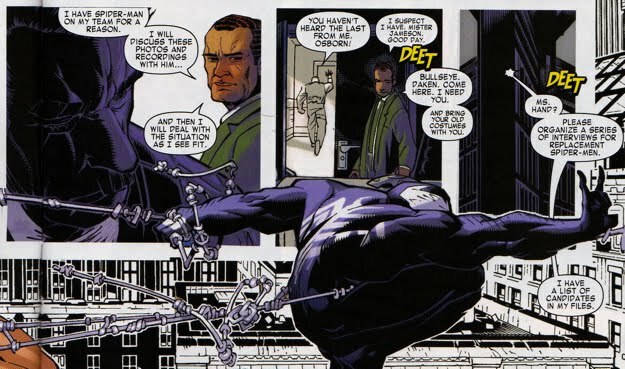 Jonah handed over all his data on Spider-Slayers over to Liz and 'Mason', and Liz instructed Tiberius Stone and Miguel O'Hara to execute on the task. As Norman's Goblin Nation attack went into motion, havoc was wreaked upon New York City and J. Jonah Jameson was forced to unleash his army of Goblin Slayers. 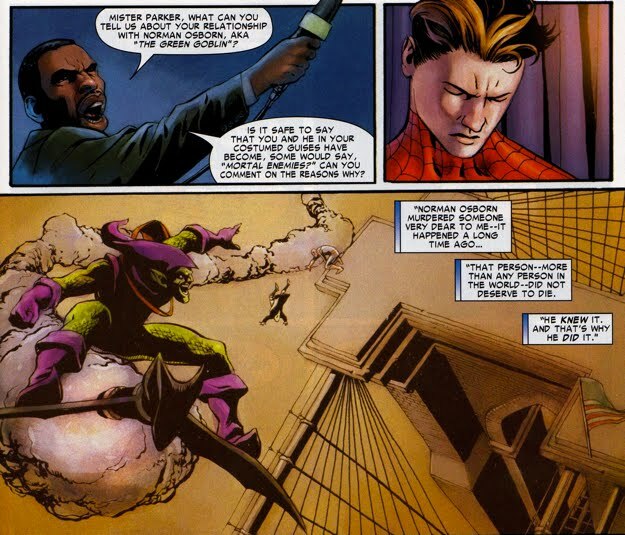 Since Norman had access to the controls on the Goblin-Slayers (via Alchemax), he quickly disconnected Jameson's access and used the Goblin Slayers to attack Spider-Man and New York City. This obviously became a PR nightmare for Jonah as Alchemax distanced themselves from the Mayor insisting that they told Jonah the Slayers were not combat ready. 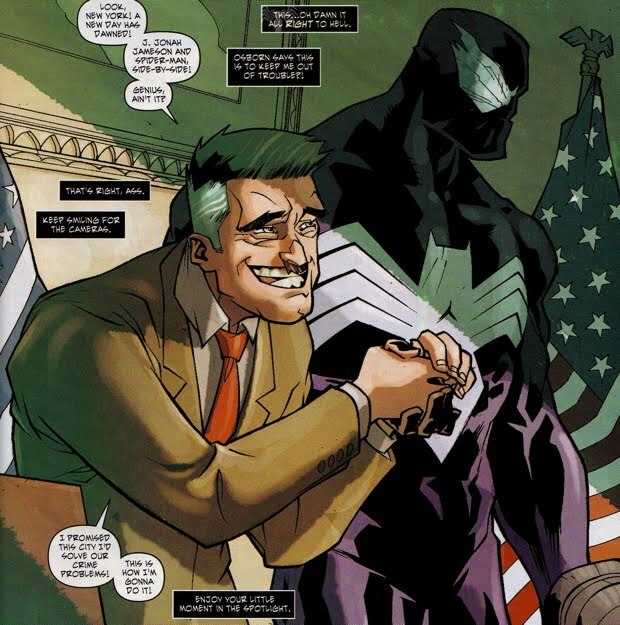 Jameson would eventually resign from office, and we get to add another wonderful installment into the Jonah and Norman dynamic as the Green Goblin managed to remove Jonah from his mayoral position. After resigning as the mayor of New York, Jonah returned to the news broadcasting business. He became a TV personality, hosting a show on The Fact Channel. After the debacle with New U Technologies (ie, The Clone Conspiracy story arc), he was fired by the station. Soon after, Jameson started his own blog and he requested a special 1:1 interview with Spider-Man. 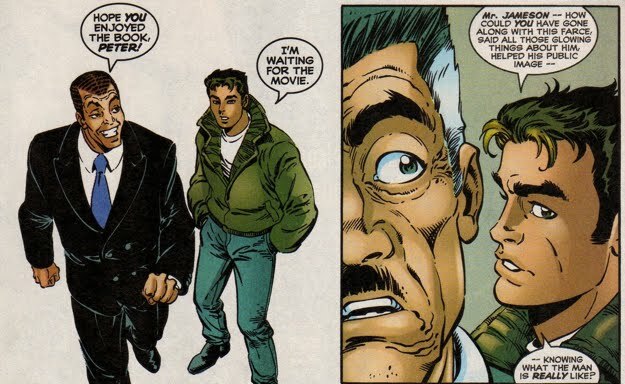 During the course of that interview, Peter revealed his identity to J. Jonah. This led to a massive shift in their relationship and Jameson not only embraced Peter but became an ally, working alongside Spider-Man. 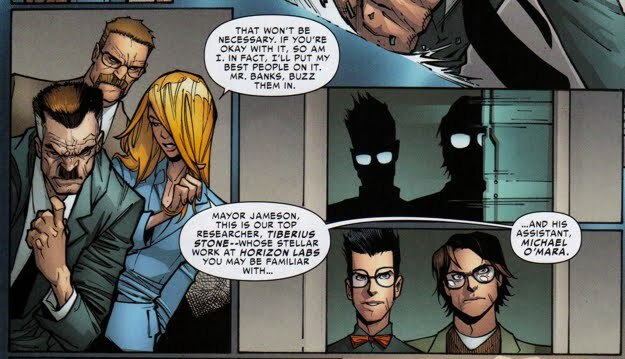 Of course the tradeoff for that was that Jameson often requested inside information for his blog. 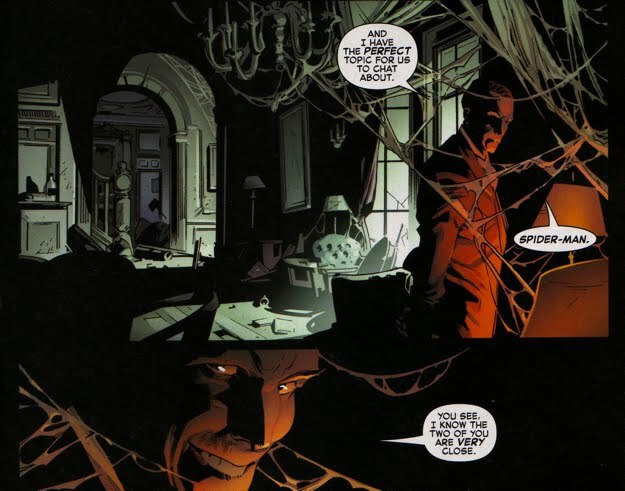 Norman kidnapped Jameson and brought him back to their old Gentlemen's Club (presumably the infamous Century Club) with the intent getting information on Spider-Man. 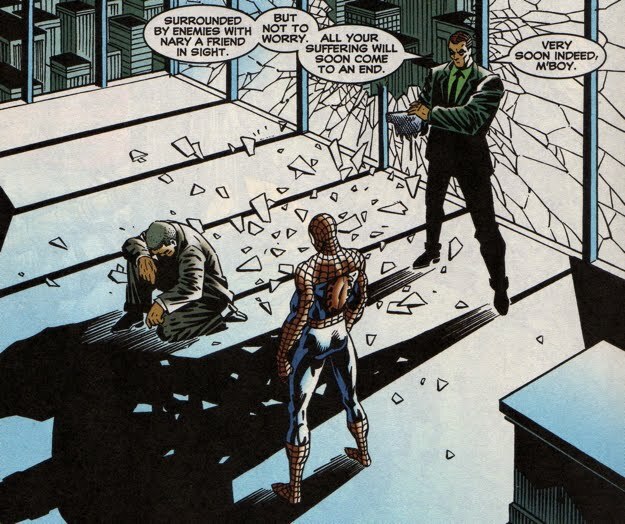 Jameson's knowledge of Spider-Man's identity became a liability and after hours of provocation by Osborn, Jonah accidentally gave up Spider-Man's secret identity. 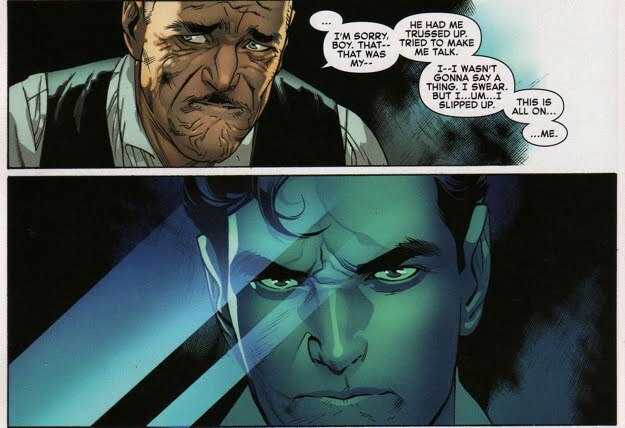 Whilst in Norman's custody, Jameson laments all those he had recently lost and he vows to prevent Peter from suffering the same pain that he had suffered. The first thing Jonah did was reach out to Eddie Brock and solicit (errr...more like blackmail) his help to combat the Red Goblin. 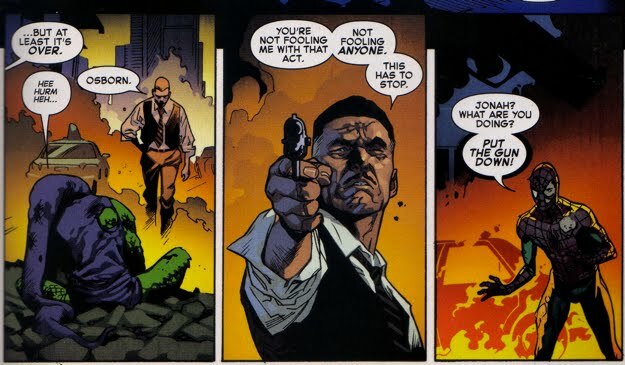 Frustrated with the seemingly endless cycle of Norman Osborn-generated madness and death, Jameson decides to take things into his own hands and kill Norman himself. 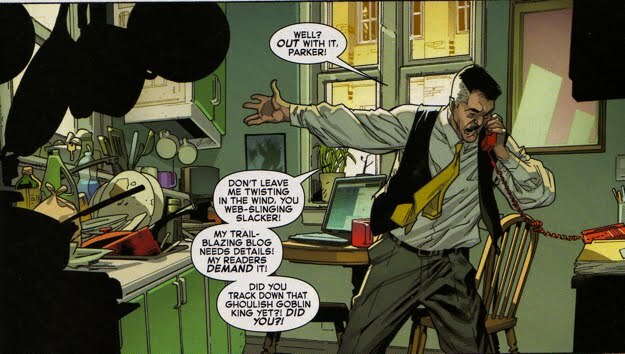 This moment was eerily similar to Jameson's frustration (and attempted murder) of Norman Osborn way back in Peter Parker Spider-Man #96. 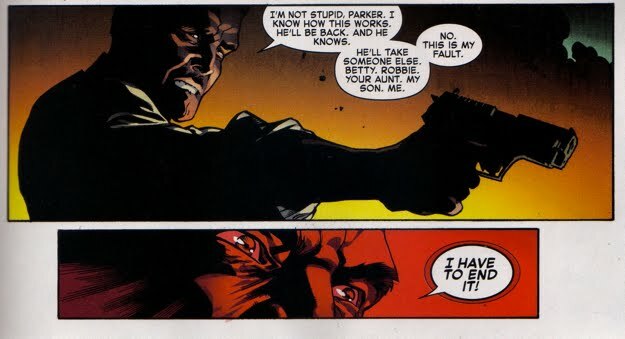 Unlike that incident in which Jonah didn't have the guts to pull the trigger, this time he did, firing point blank at the defenseless Osborn.